He used to lose to his sister. His coach is in jail, and he has never won a medal at a major international meet. Yet U.S. sprinter Tyson Gay considers himself the favorite for the 100 meters, the traditional highlight of the athletics World Championships which open Saturday. With 9.84 seconds running into the wind, Gay is the top performer in the world this year - he is unbeaten and ran a wind-aided 9.76 time, coming within one hundredth of the world record of his great rival Asafa Powell. Little wonder people ask what has gotten hold of Gay, who for a long time was said to be too slow for the 100. 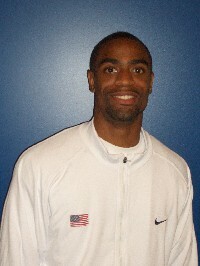 In a sibling rivalry with sister Tiffany, one year his senior, Tyson Gay was often outsprinted. He credits those childhood losses for making him the fearsome competitor that he is at age 25. "She was the motivation to become the person that I am today," he said Thursday, two days ahead of the opening heats. "Throughout my career people have been in front of me, just like my sister has," he said. On Sunday, he wants to keep everyone behind. He remembers what it was like the first time he crossed the finish ahead of his sister. "It is a same similar situation," Gay said. "I just continue to work hard to catch that person." That person this weekend is Jamaica's Powell, who is also chasing his first world championship title. Both are unbeaten this year but have not raced each other. Gay is becoming familiar with the thrill of winning, though he has not experienced what it is like to win a gold medal at a major international event. "I don't know what the feeling feels like," he said. His best result was fourth in the 200 at the 2005 Helsinki world championships, where he entered as favorite but got distracted by the occasion. "I was a little more excited in those time," he said. "There were some 50,000 people cheering you along. I got a little too overexcited. I am a little more calm now." Usually, a high-profile athlete like Gay would have a coach close by, to keep him in the right frame of mind. That is not possible, this time, for Gay. His mentor Lance Brauman is nearing the end of a prison sentence for embezzlement, theft and mail fraud. "I kind of miss that aspect of everything," Gay said. At the same time, the coaching situation taught him self reliance. "It allowed me to learn how to train diligently in the absence of my coach and that really made me become a better man," he said. He hoped Brauman would be released by next week but added he would not come to Osaka by the time Gay goes in the 200. U.S. men's coach Pat Henry thinks Gay has achieved extraordinarily well despite the lack of close contact with Brauman. "He has matured in the sport very, very well, unusually well for as young as he is," Henry said. In Europe some have questioned how Gay's performances have improved so dramatically. "My only explanation would be my focus on the 100 this year" instead of the 200, Gay said. And he is working with former sprinter Jon Drummond, well known for his speed out of the blocks. "He showed me a few tips to get my start better. He told me to get away a little bit stronger," Gay said. Drummond said Gay was improving because a good listener. "I enjoy working with him because he asks all the right questions."